Admitting how much we really loved this quiet part of Normandy feels like a dangerous act – fearing publicity will attract the masses and spoil the peace. The Haras is just the place to get away from it all: a great location set in beautiful countryside with only small towns and real people in the vicinity. The pace of life of this part of rural France has to be a cure-all for those needing a break from the hustle. Cheese, seafood and calvados – what a combination! William the Conqueror’s chateau in Falaise is fantastic (even for a displaced Welshman growing up with castles) and the town is a delight. We were amazed, both coming and going (we are slow learners), how easy it was to get to Neuvy (we took the train from Paris to Caen and then rented a car). The beaches of Normandy and the D-Day history, Bayeux and the tapestry are within easy reach. All this and the horses at the Haras had us ready to chuck it all in and ask for employment as stable hands. Nous voulons vous remercier pour l’agréable séjour que nous avons passé dans ce très beau gite, et Bravo pour le très beau site. Ease of access to this amazing part of France from Paris and England and the very easy driving really worked for us. We loved making closer connections with some of the key events and personalities in both English and French history – medieval and modern – such as William the Conqueror, Eleanor of Aquitaine, the Normandy landings in WW2. Seventh heaven if you’re a history buff. The perfect rural setting of the Haras du Gazon made it an ideal place to relax after our busy days of sightseeing and sampling the local fare, which was another highlight of our visit. Be warned – lashings of butter, cream, cheeses not to mention cider and calvados. We found that long walks in the countryside seemed to ward off any consequences! We only have one complaint to make about our stay at Haras du Gazon. It was far too brief! The beauty and charm of this property was overwhelming. Stone walls adorned with climbing roses, cobblestoned courtyards, geometric hedges and glorious formal water gardens placed us in an elegance of earlier times. We’d come from strenuous cycling endeavours in the Alpes and Pyrenees and this was exactly what we needed before returning to Australia. It was delightful to wake to the whinnies of the horses as the stable hands approached with delectable barrows of hay, all lovingly grown by Tim through the summer season. We unwound by taking walks around the property and saying hello to the beautiful mares and foals who were always inquisitive and frequently put on a gymnastic display to entertain us. We even got to meet the little Normand cows who would grow up to produce the irresistible camembert cheese of the region. We enjoyed watching the young showjumpers go through their paces on the purpose built arena. Spend a little time with Tim and he will convince you that their breeding is as intricate as any thoroughbred racehorse. We did briefly venture into the local town to stock up on cheese and wine and did see William The Conqueror’s Castle. Unfortunately impending plane journeys cut our visit way too short. The problem is it’s so hard to tear yourself away from the beautiful property to take advantage of all the region has to offer. We will be back to avail ourselves of Tim and Annie’s hospitality in this special place. We thoroughly enjoyed our stay at Haras du Gazon. We’d never been to Normandy before but it is absolutely stunning. So much to do – or not have to do – depending on what you’re looking for! The gardens of the Haras are beautiful and really well maintained. It’s so nice to be able to actually ‘stay’ somewhere like this rather than just visiting for a few hours! The on site pool is a real bonus and grounds are lovely. Would really recommend a stay there. Plus it’s so close to Caen you don’t have to spend hours driving through France to start your holiday. Will definitely be back next year – this time with a little one in tow! Thank you for a lovely few days – you are always so welcoming. My favourite place in France. It is simply the most beautiful establishment. You are surrounded by perfect photo opportunities as you can’t possibly take a bad photo here! Not only is the countryside beautiful, it’s peaceful, quiet and the paddocks are full of stunning show jumpers. Tim and Annie Holford are the kindest and most wonderful hosts. I can’t recommend staying here more highly, a must do if visiting Normandy!! 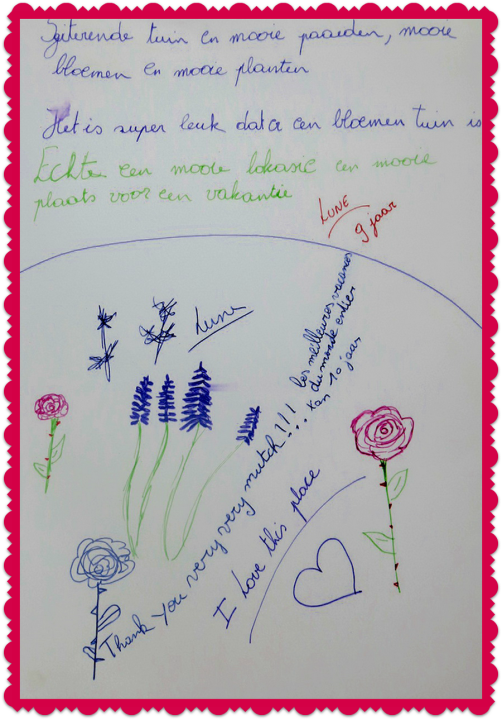 From our lovely guests from Belgium: Two families who chose to see the New Year 2014 in at the Haras du Gazon ! JUST A PERFECT STAY! ***** We were very much looking forward to this stay in Normandy, but once we arrived in front of the monumental main house, we knew our expectations would not be let down. The property is just beautiful, with horse stables, beautiful garden, nice old buildings completely restored. The inside of the gîte Almé was perfect and much more than we hoped for: cosy interior, all the equipment you can possibly dream of (steam cooker, toaster, coffee machine, iron, dish washer, washing machine, flat screens, dvd players, iPod box), completed with very good beds, lovely bed and bath linen and a lot of space, even for 12 people. The owners are very friendly, and helping out with every question you have, but also very busy with taking care of the many horses they are breeding. This is an address to return to, and to recommend to other travellers. Perfect to explore Normandy, to do some walking and biking, to enjoy fresh seafood, discover the French ‘bled’ and learn about the history of the second world war. Liked best: we liked it all ! Liked least: nothing, it was all good Travelling group: Extended Family Would I recommend this vacation rental to my best friend? Yes. Recommended for: Friends getaway Older travellers Families with young children • The property was “as advertised”. • I recommend the location. • The property was a good value for the price paid. Thank you for a most wonderful Easter break. We have really enjoyed the peace, the horses, especially the newborn foals. Five teenagers have been kept well entertained with the games room, the pool (yes they did have a swim! ), the bikes etc, etc. You couldn’t have been more welcoming and we will definitely return. Tim & Annie have done a fabulous job on the gîtes. Beautifully appointed and in a setting that truly deserves the description of idyllic. The rustic nature of the place in its natural form lends a relaxing feel that is hard to match. My family had a restful stay. Normandy itself is fascinating. Great food, cycling, history & culture all within an arms reach. Tim & Annie are perfect hosts and have provided gîtes of the highest quality with every thought for the facilities required. Add to this an idyllic setting, a haven for animal lovers, bags of activity for adults and children and you have a winning formula for a break in Normandy. The Entire Family Loved Our Week! What a wonderful week in Normandy! A++ hospitality. 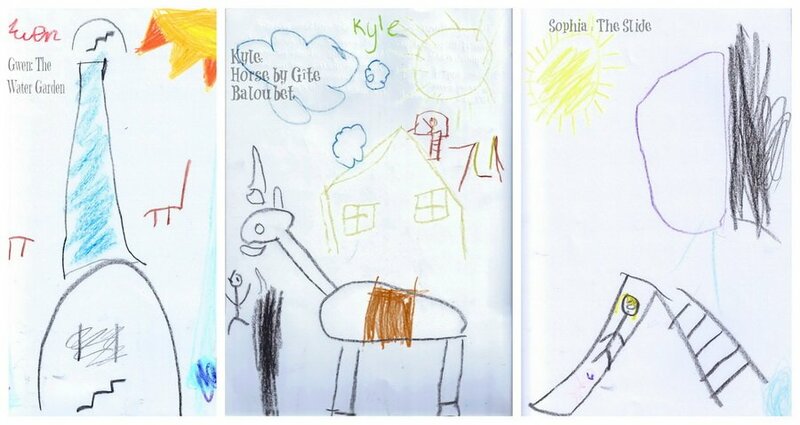 The entire family loved our week on the horse farm. Thank you for all you did; gifts,directions,suggestions for entertainment, to make this our favourite vacation. We’ve been here for a couple of days and enjoyed it. Tim & Annie are very friendly and gave us the ‘Special Guest’ feeling. It was nice and quiet for the children (aged 11-16) There was enough to play with and they enjoyed swimming in the pool. If you like walking we can recommend the ‘Swiss Normande’-there was a lot of information in the gîte. We had a nice relaxed week, the gîte was warm and clean, everything was good and Tim & Annie made us feel like home. 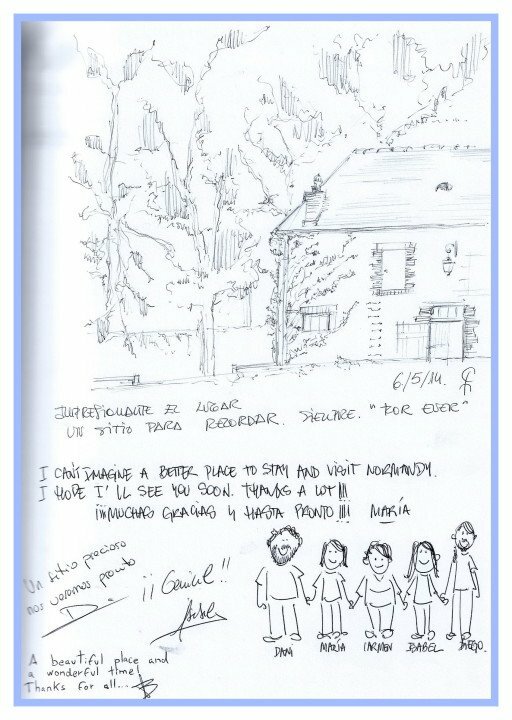 Our artistic guests from Madrid left us a wonderful pictorial review! We All Had a Lovely Holiday! We are s glad we chose your gîte to stay at. the accommodations were perfect; Clean,beautiful and you were both very hospitable. We hope to see you again in the future, Thanks again . We were a party of 7 adults and 9 children ranging in age from 2 -15 years. Both gîtes were absolutely beautiful with every facility/amenity that you could wish for. 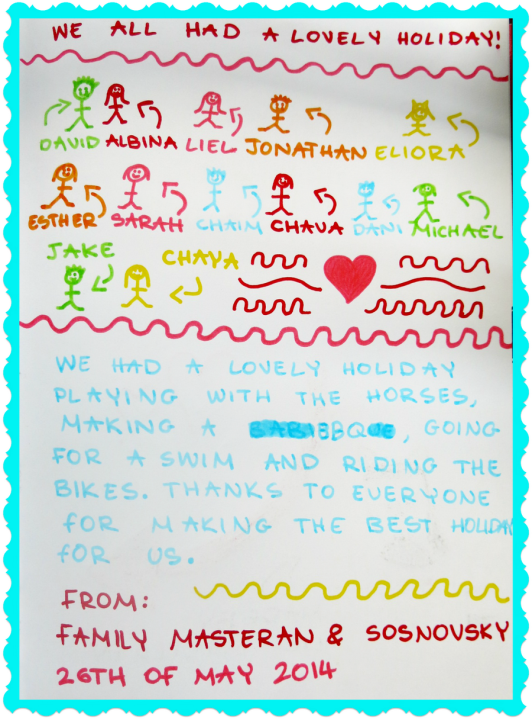 There were so many things for the children to do from swimming to table tennis to bike rides to explore the area. Tim & Annie, the owners could not have been nicer or more helpful. Anything that was required, they were more than willing to assist and could not have been friendlier; nothing was too much trouble. The weather was not particularly good but everyone had a fantastic holiday and have all agreed that we would like to come back. Thank you Tim & Annie, for sharing your beautiful home. Thank you for the brilliant stay, lots of great memories and great horses. The highlight of our stay was being at a working horse farm in the middle of incredibly beautiful countryside. We liked the central location, only 20 minutes’ drive from Falaise and other cities within easy driving distance. Also the price is very reasonable. What a wonderful place to stay! In all of our travels throughout Europe over the past 6 years this is by far our favourite and most memorable accommodation. Thank you for the hospitality. 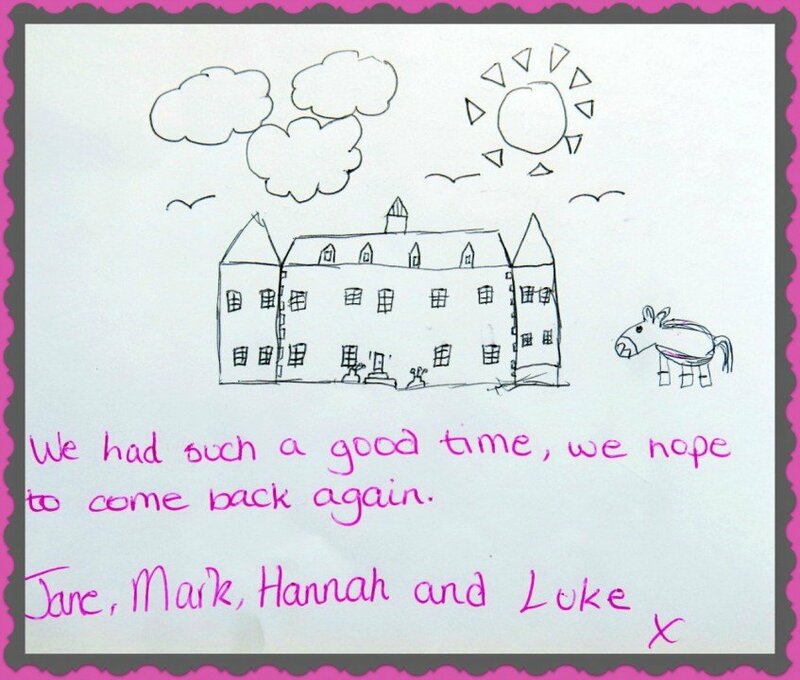 We look forward to bringing our children and extended family back soon! We visited Haras du Gazon in late August 2014, and had the most amazing stay. Anne and Tim are wonderful hosts, and shared so many different ideas on things to do in the area with children. 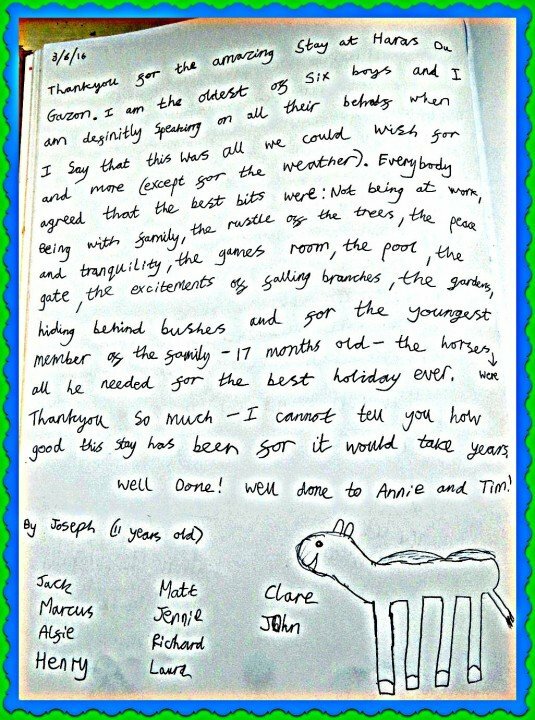 We were 4 adults and 4 kids, and enjoyed their wonderful gite. The pool being covered, was such a delight. The children came home from their outings and jumped straight in.The horses neighing in the morning just seemed unreal, the kids enjoyed visiting them everyday.We visited Falaise, and William the Conqueror’s castle, the farmers markets in the area, some wonderful restaurants, and still felt like we had a home in the middle of nowhere, which was fantastic!! We will definitely return…!! !Thanks so much for your wonderful hospitality Anne and Tim. We Have Really Enjoyed Being Here! Our group of seven have just returned from a wonderful holiday at the Haras du Gazon (staying in Gite Alme). Quiet and relaxing, it gave us all the opportunity to completely chill out and enjoy the weather, beautiful gardens, swimming pool and get to know some of the local residents! It’s been a real treat to wake up everyday so close to the horses! Equally, there was plenty to explore just a short drive away when we had the energy to. Brilliant hosts that made everything very easy from booking to arrival and throughout our stay. Highly recommended. 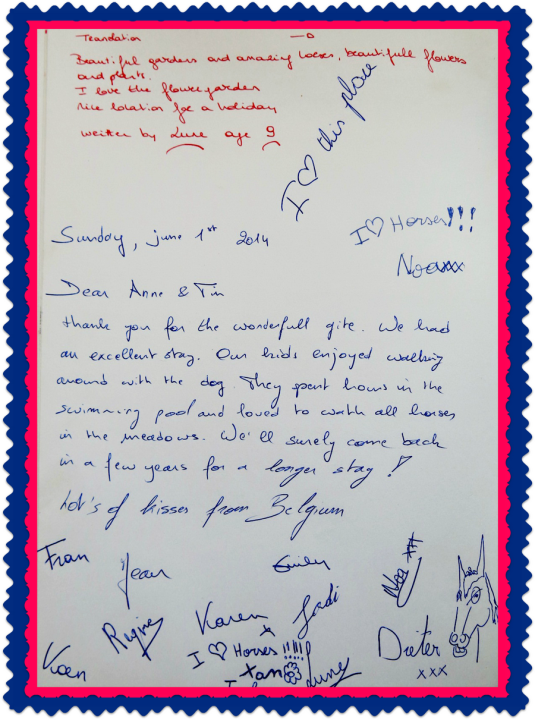 Thank you for having us to stay at the Haras du Gazon. Your home is lovely and we have really enjoyed being here. Hopefully we will see you again in the future. Thank you for a lovely gite, beautiful surroundings, a relaxing holiday. 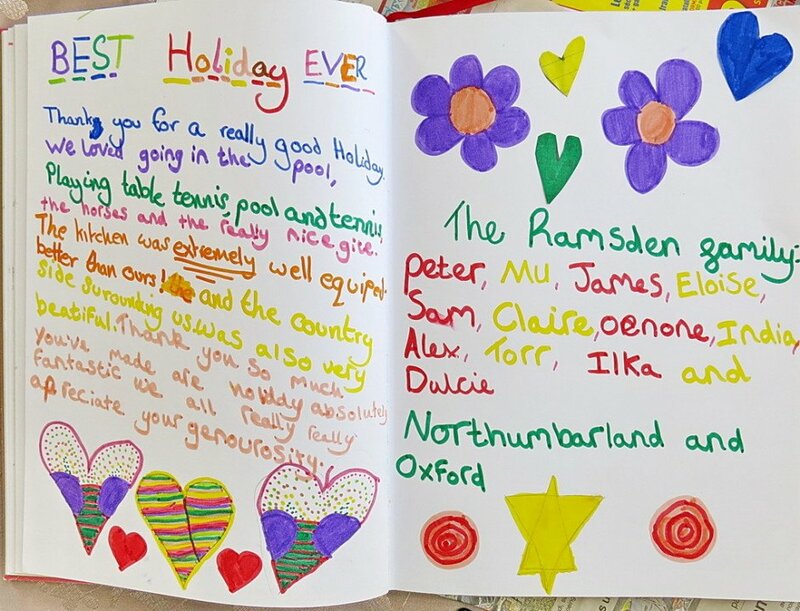 The children enjoyed the pool and games room and all the outside space.Plus the wonderful gardens and grounds were very much appreciated by all. Many thanks. Our only regret is that we didn’t book a fortnight! What a wonderful week in Double Espoir! Our only regret is that we didn’t book a fortnight. The gîte is well appointed with everything you need for a week away; all the details are attended to with thought and care. We visited Falaise, Argentan, Bayeux, Putanges and many more. We need to come back and explore more next year. Beautiful pool, gardens and of course the beauty of the horses. This place has a spirit – I miss it already! This place is fabulous – we are very sorry to be leaving. the gite has everything: wonderful comfortable places to relax, a superbly equipped kitchen,warmth aplenty,great beds and bathrooms. The horses and riders have been great company. 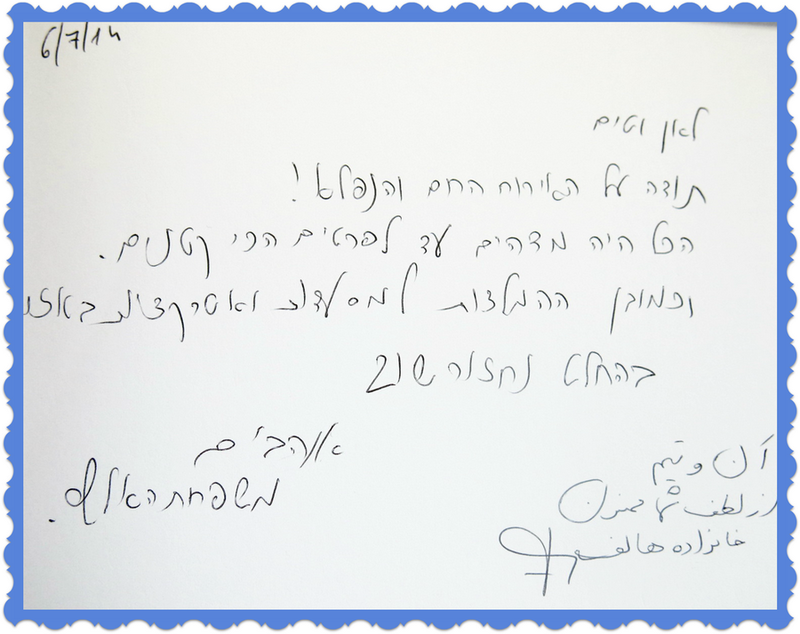 Thank You – we are already talking about a return visit! 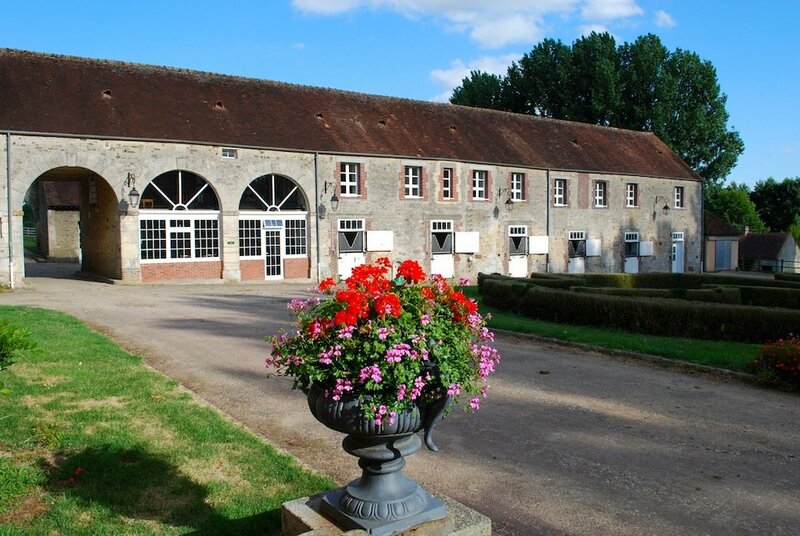 We were all very excited to come back to the Haras du Gazon this year and to try out a new gite ( 2 down & 2 to go!) The house is beautiful, the setting is tranquil and Anne is very warm and welcoming. There’s so much to see and do nearby and we will definitely be back. I cannot tell you how good this stay has been! We’ll Never Forget the Lovely Time We Had! We have had a fabulous holiday in this gorgeous gîte rurale. The kids loved seeing all the horses and feeding the fish. 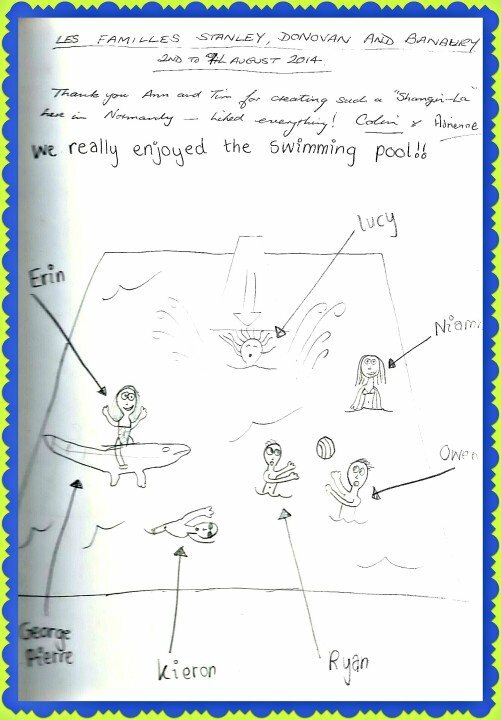 And of course the brilliant swimming pool- they have turned into fish themselves as they would not get out of it! The relaxed ambience of this lovely place has been very nurturing for us all. Your hospitality and helpfulness enhanced our stay. We particularly loved your picnic recommendations! Thank you so much for a lovely Christmas at the Haras du Gazon. The gîte was great, very comfortable, well equipped, very clean; so warm and cosy! We had a relaxing time, did lots of cooking, guys enjoyed the games room and of course we all enjoyed walking around the property, so amazing! And it was so nice petting the horses and feeding them carrots. This was our third visit to the Haras du Gazon and another lovely week. We have been very comfortable in Cor de la brière and hope we’ll come back again. Thanks Anne & Tim! Another wonderful visit to your beautiful part of the world!